The pens built between 1970 and 1990 have a capacity ranging from 80 to 250 head. The pens built after 1990 are all 250 feet by 250 feet and hold 300 head of cattle. The pens have a clay based bottom, are built on a 3% slope and have a water bowl in the fence line. The pens built during the expansions in the 90’s were constructed according to Provincial regulations. There are containment ponds in the new lot. There are monitor wells surrounding the feedlot perimeter. 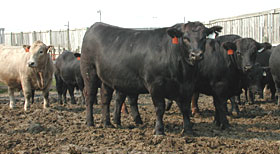 Cattle are purchased through the auction mart system, order buyers and direct from farmers. Steers ranging from 500 to 1000 pounds are purchased throughout the year. All cattle are weighed individually and sorted into lots by weight. Cattle are also vaccinated and treated for parasites at this time. Finished cattle are marketed between 1400 and 1500 pounds. Pound-Maker ships cattle to processors in Alberta and Saskatchewan. Rations include dry rolled barley, barley and corn silage, cut hay, wet distillers grain (co-product from ethanol production) and minerals and supplements. As well, cattle may receive thin stillage as the liquid source. There are significant benefits to feeding the co-products from ethanol production. The fermentation process begins the process of breaking down the nutrients and this aids in digestion. The animals can utilize the co-products more efficiently than whole grain. By feeding the combination of wet distillers grains and thin stillage, other low quality (and low cost) feedstocks can be used in the rations with no loss in production. The protein required for the animal is produced on-site with no additional production or transportation cost required. 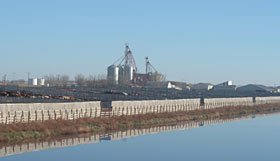 Pound-Maker produces corn and barley silage as well as purchasing silage from local shareholders who produce, harvest, and deliver the silage. The silage producers are paid throughout the year using a formula based on the price of barley. 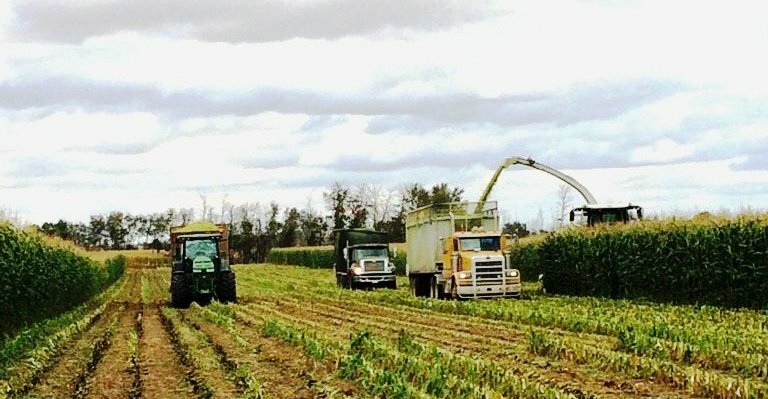 Pound-Maker requires approximately 25,000 metric tonnes of silage each year. Pen riders ride through the pens every day checking the cattle health. If there is a sick animal, the animal is removed from the pen and walked to the hospital where animal health technicians treat the cattle. A computerized health program is used to track animal health. Veterinary services are contracted through Animal Management Services at Humboldt. All animals are individually ear tagged with a Pound-Maker feedlot tag which includes the lot number the animal is from and an individual number. As well, all animals require a CCIA tag upon leaving the herd of origin. 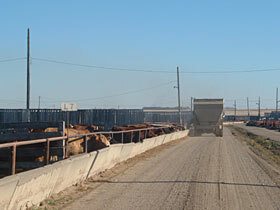 If an animal loses a tag during transport to Pound-Maker, the CCIA tag is replaced at the feedlot. Pound-Maker maintains pen conditions throughout the winter by levelling the pens. The manure gathered by the leveller is removed from the pens. 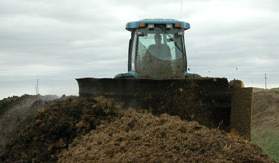 This manure is turned and allowed to compost using a compost machine. There is significant reduction in the weight and amount of manure from the composting process. Pound-Maker operates a summer grazing program that has light weight steers purchased in late winter and fed in the Feedlot until May when the cattle are put out to pasture. 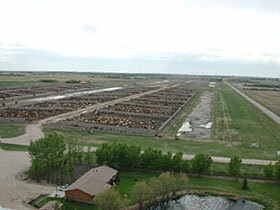 The cattle come back to the Feedlot in September and October to be finished. The administration, cattle, feed team and yard crew consists of 35-40 people. Approximately 75% of the employee base were born and raised in the local area. Pound-Maker has competitive wages and an excellent benefits package. Pound-Maker is an important part of the community as Pound-Maker's initial vision of providing alternative markets for grain, providing employment for local people continues today.